Renovated Cozy Chic North Fork Cottage, steps away from the Beach & Wine Trail!! Tucked away in a friendly beach community with only a short 3-5 minute walk to the private beach, our North Fork Cottage is ideal for a family or up to three couples! Perfect spot to relax, spend time with family and friends and enjoy life the way it was meant to be. Only 90 minutes from Manhattan, and close to the towns of Jamesport, Southold, Greenport and Shelter Island, our North Fork Cottage is an amazing escape from the hustle and bustle! Enjoy all that North Fork has to offer and explore family-run wineries, organic farm stands, craft beer breweries, horseback riding, unique shops, great restaurants, and the list doesn’t end there! Our NoFo Cottage is in a great location, with everything at your fingertips. Want to unwind and relax, head to the private beach to soak up some sun, dip into the protected calm waters, or take a long walk along shore, breathing in the clean refreshing air. If you want to tour the local vineyards, you’ll be in the heart of Long Island wine country! For an alternative to wine, check out local breweries, the Cider House, or even a vodka/gin distillery. Looking for fresh fruit and homemade pies, look no further, as there are farm stands nearby – or you can choose to explore the numerous noteworthy restaurants on the North Fork! You can find it all within 5-10 minutes of the house. Additionally, the water park, the aquarium and Tanger Outlet Mall are only 15 minutes away. And if you want to explore the South Fork, the Hamptons are only a half hour away! Newly renovated, this NoFo Cottage has been designed in a modern simple style, with a palette of whites and neutrals to create a serene and peaceful escape. Inspiration was drawn from the quaint, pure and easy coastal lifestyle of the North Fork. The home can accommodate 2-6 guests. It has 2 private bedrooms, each with a queen sized naturally hypoallergenic and antimicrobial memory foam mattress. Additionally, the home features eco-friendly amenities, which include LED lightening, energy star appliances and sure-wood forest products, brand new fully equipped kitchen, private renovated bathroom, flat screen TV with cable, Bluetooth iPod compatible radio, pull out couch, ceiling fan and air-conditioning. Lastly, the home also has a newly built deck, featuring a new gas grill, where you can enjoy dinner outdoors, or simply relax, take a nap or read a book in the swing chair. My love and desire for the water started in my childhood years, growing up on the South Shore of Long Island. The water inspires me in every which way, and I knew that I always wanted my own piece of waterfront paradise. My professional background is in Real Estate - I own and am responsible for dozens of rentals across the NYC metro area. After traveling outside of the U.S., which include destinations in Europe, South America & Caribbean, I decided to take all of my experience and passion to pursue my dream on the beautiful North Fork of Long Island. Newly Renovated Clean & Crisp Full Size Shower with Rain Shower Head. Shower features overhead sky window for an outdoor feel. Pillows, blankets, linens & sheets provided. Fully Stocked With Pots & Pans, Dishes, Glassware, Silverware, Etc. Great place tucked away in a quiet community. This property is superbly clean and very well designed. We really enjoyed our stay! Beautiful home! Loved every minute of our stay! What an amazing stay! Billy was such a wonderful host, and I can't say enough about his beautiful cottage! Everything is newly renovated, super clean and just simply chic! I fell in love with the decor. 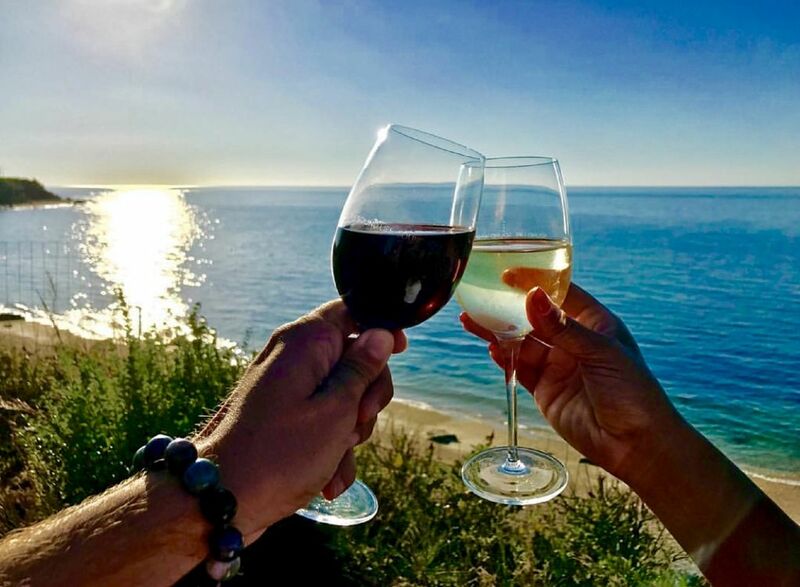 The location of the cottage is perfect - close to a private community beach, Tanger shopping outlets, Cider House, and of course, the wine trail! It was a true escape from the city life, and will definitely be coming back. Highly recommended! Baiting Hollow is the gateway to the North Fork. Wineries, Farm-stands, Beaches and Parks are all within a short drive of the home. You are located right in the center of it all!